The Novosbed line of beds has gotten a little bigger with the addition of a brand new hybrid: the Brunswick mattress. Built with gentle layers of memory foam and sturdy pocketed coils, this bed is designed for excellent mobility and pressure relief. But does its construction actually create the feel its after? I won’t know until I jump on the bed and test it out myself, scoping out its firmness, motion transfer, pressure relief, and sinkage to find out if this mattress is really worth its stuff. Continue reading on for my full assessment! In a hurry and just want the good bits? Skip down to my review summary. The Brunswick is a new bed in a box hybrid from Canadian company Novosbed. It's got great bounce for the combo sleepers out there and you can save $50 on your purchase by clicking this link! As I mentioned up top, the Brunswick is part of Novosbed, a Canadian retailer that got its start in 2009. 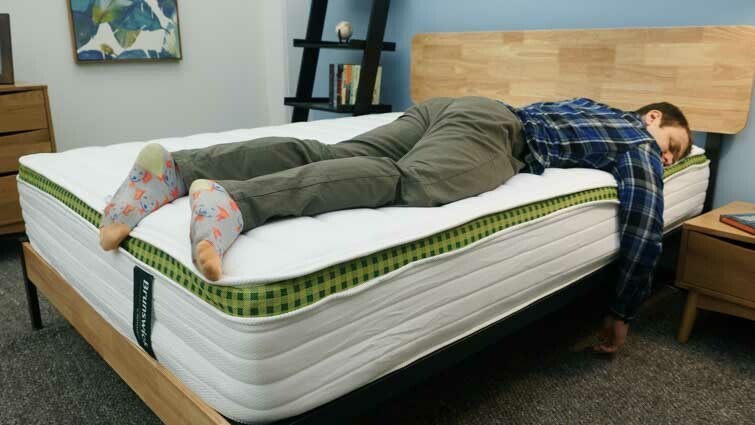 While the company began with a single all-foam mattress, it soon grew to encompass several different brands, including not only Brunswick, but also Logan & Cove, Douglas, and Recore. Though all these models fall under the Novosbed umbrella (and also happen to be developed, made, and produced in Canada), they’re actually quite different. I won’t explore all these mattresses in this review, but I will be sizing the Brunswick up against the Novosbed and Logan & Cove a little later on. But for now, let’s turn our attention back to the maple-leaf-star of the present: the Brunswick mattress! What is the Brunswick Made Of? The Brunswick features a 12” profile of gentle memory foam and pocketed coils, intended to lull sleepers into a pressure-relieving yet supportive slumber. While this design is fairly typical for a hybrid bed, the Brunswick packs a quirky punch with a special hemp blend in its cover. To see how all of this comes together, let’s dive into the mattress! Cover – Comprised of polyester, spandex, and hemp, the Brunswick cover is stretchy and breathable. While hemp has a fairly similar feel to cotton, it’s slightly more durable, so can withstand more wear-and-tear. Pillowtop – At 2.75” tall, the pillowtop is actually made up of three thin layers of memory foam, allowing for some immediate comfort as soon as you hop onto the bed. This material is known for its deep body-contouring and sinkage, so should provide some pleasant pressure relief as you adjust to the structure. And while memory foam has a bit of a reputation for overheating at night, one of the layers here is infused with gel to help mitigate some of that heat retention. 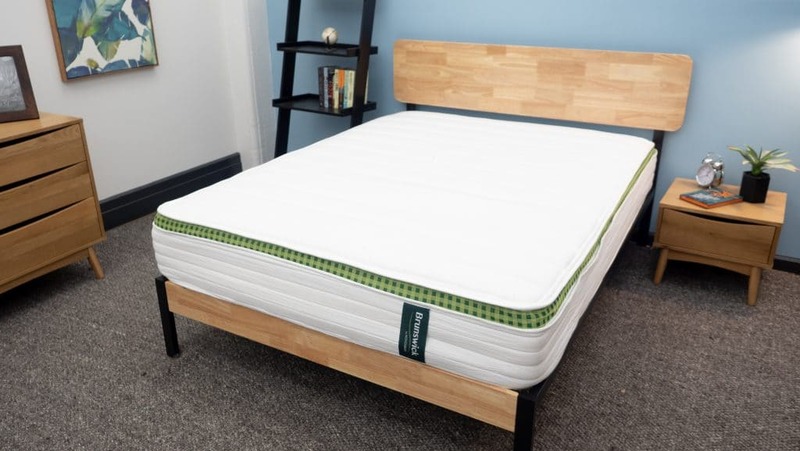 Support – Though the top section of foams is likely to cradle your body as you settle onto the mattress, the pocketed coils that make up the majority of the bed will rather quickly counteract this sinkage. And how? By relying on their supreme bounce to lift you up and out of the structure. This way, you’re likely to feel more “on top” of the bed than it and shouldn’t feel too stuck in the mattress. While a wide range of sleepers could benefit from this feel, I’d say it could be particularly beneficial for combo sleepers who need to change positions in the night. How Firm is the Brunswick Mattress? After going over all the construction details with a fine-tooth comb, let’s get into the Brunswick’s feel, starting with how firm it is! As I pressed my hand into the mattress, I was struck by the softness of the cover and the cozy comfort of the pillow top. Pushing in further, I could really feel the thin memory foam layers contouring to the curvature of my hand, resulting in some nice pressure relief. However, once I added more force, it was all about those bouncy coils, as they responded to my pressure with a buoyant lift that catapulted me up and out of the structure. I’m interested to see how the rest of my body will react to the Brunswick, so let’s hop on the mattress and give it a whirl. And just so you know I’m doing my due diligence, I won’t be relying solely on my opinion to determine the firmness of this mattress; rather, I’ll be incorporating perspectives from three of my coworkers as well. 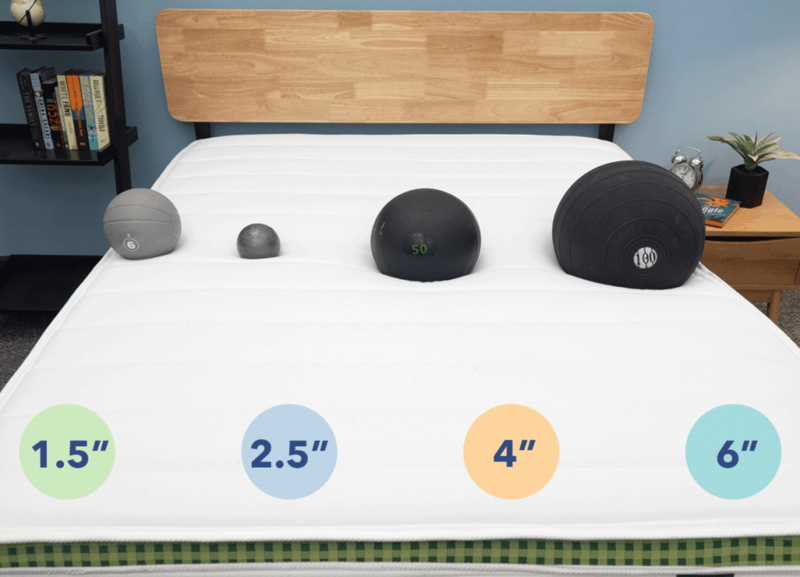 Therefore, the firmness rating below is actually a composite of our four different experiences on the bed. We were somewhat in agreement about the firmness of the mattress, with all of us falling in the 6-7 range. 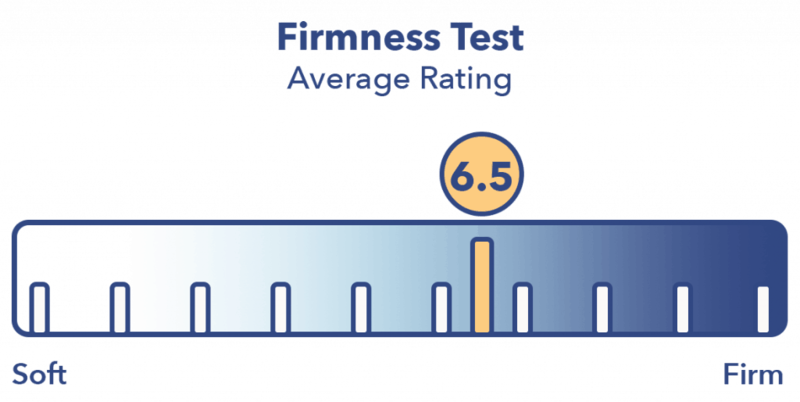 As you can see on the graphic, once we averaged out our personal ratings, we landed on a 6.5, which syncs up perfectly with the industry standard for medium firmness. I personally gave the bed a 6 as I found its overall vibe to be just a touch softer than medium firm. 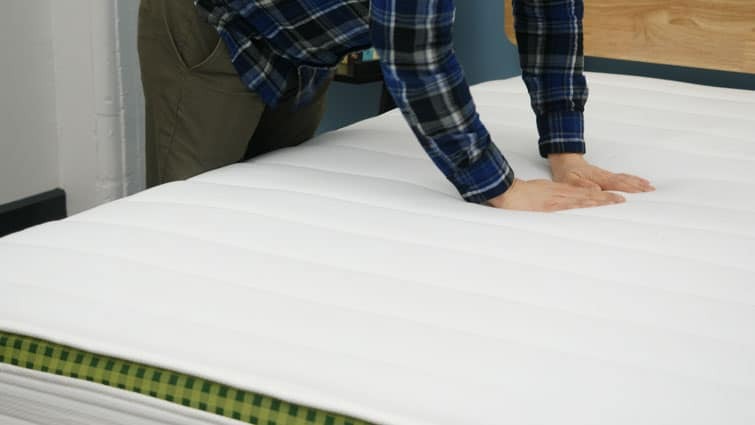 While you’ll certainly feel a ton of bouncy support from the tall section of pocketed coils, this doesn’t mean you’ll miss out on the gentle hug of the memory foam top layers; on the contrary, the materials work together to produce a satisfyingly balanced feel. Though this may be both too firm for strict side sleepers and too soft for strict stomach sleepers, I think it could hit a sweet spot for those who doze in multiple positions throughout the night. Next up, I want us to take a look at how the Brunswick handles pressure. 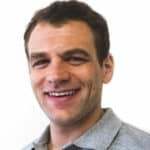 And no, I’m not talking about whether or not it can live up to the high expectations others have it, but whether or not it can relieve pressure at sensitive spots along the body (i.e. the hips, shoulders, and lower back). 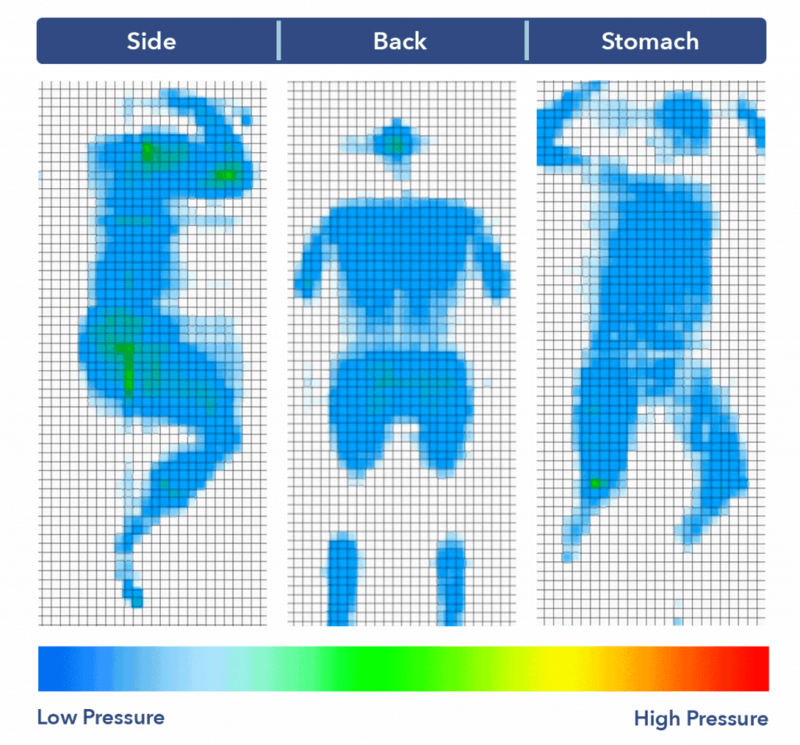 To measure this, I’m going to stretch out on a pressure map, which will visually demonstrate how my body’s interacting with the bed utilizing a gradient of different colors. If the image lights up all blue, there’s virtually no pressure recorded. If it’s red, however, things have undoubtedly gotten a little tense. Back – Lying on my back, my weight was pretty evenly distributed across the surface of the mattress. As I sank into the euro-style pillowtop, I could feel the memory foam layers filling in the space at my lumbar region for some satisfying pressure relief. Though I definitely experienced a bit of gentle cushioning in this position, it was never so extreme as to leave me feeling stuck in the mattress. Side – Turning onto my side, this comfort got a little more complicated. While I was still experiencing some nice relief through the top layers of foam, I could feel my shoulders and hips digging into the pocketed coil section. This caused some tension at these spots (which you can see in the graphic), so I’m not sure I would recommend this mattress for those who doze strictly on their sides. Stomach – Rolling over to my stomach, I initially felt quite cozy until the top layers of foam caused my hips to dip out of line with my shoulders. It wasn’t the most uncomfortable feel, but would probably cause stomach sleepers issues as they tend to go for firmer structures that support a more natural spinal alignment. Again, I’m left thinking this bed is best suited for combo sleepers who switch between positions as they sleep. As we briefly touch on up top, Brunswick is one of several bed-in-a-box mattresses taking Canada by storm! While it’s a fantastic product in its own right, I thought it might be fun to compare/contrast it with some of its biggest competition on the scene: the Novosbed and Logan & Cove mattresses. Unlike the Brunswick, the Novosbed is made entirely of foam, which results in a gentler feel. However, it also comes in three different firmness options, so can be firmer if you like. Additionally, nearly 4” of memory foam in the comfort section of the Novosbed makes for a pressure-relieving structure that’s fantastic for side sleepers. Price-wise, the Novosbed is a little more expensive than the Brunswick, coming in at CAD $999 for a Queen compared to the Brunswick’s $749. Check out my full review of the Novosbed to learn more! The Logan & Cove is also a hybrid bed, though at 14”, it has a taller profile than the Brunswick. Like the Novosbed, the L&C comes in different firmnesses (though only two compared to the Novosbed’s three). It also has an extra layer of edge support in the base, which makes for a sturdier structure that could be great for couples. As far as price is concerned, it costs as much as the Novosbed (CAD $999 for a Queen), making the Brunswick the least expensive of the bunch. You can click here to find the full review of the Logan & Cove. Are you a Canadian shopper? Check out my guide to the best Canadian mattresses! 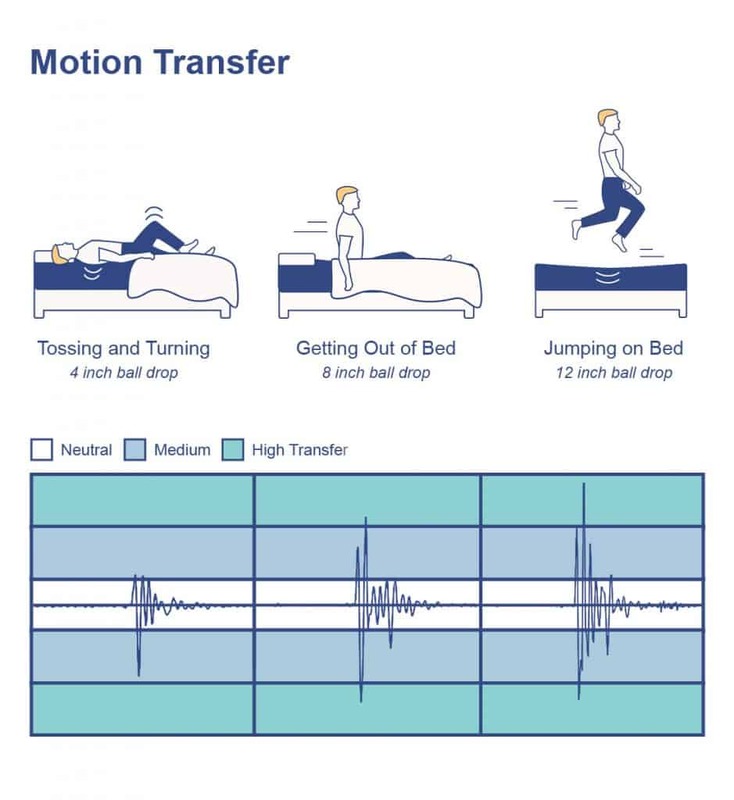 Competition aside, let’s get back to fleshing out our understanding of the Brunswick mattress by assessing its motion transfer, or the amount of movement discernible from one side of the bed to the other. While this is an important test for all sleepers, it could be especially relevant for those who share a bed with a partner (or even a furry companion). These are just below average results for this test, which tells me that motion is likely to be felt across the structure. 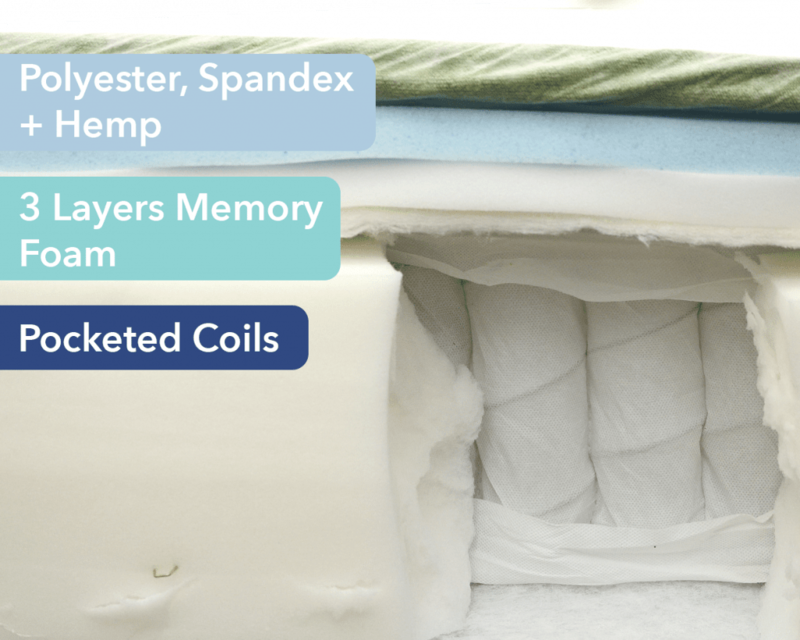 While the memory foam top layers do a decent job of dampening this disturbance, the tremendous bounce of the pocketed coil section makes it so you’re likely to feel some movement in the night. And finally, let’s wrap up our tests with one focused on sinkage! Basically, this section will let you know whether you’re likely to feel more “on top” of the bed or “in” it as you gradually ease into the structure. These results are consistent with other beds I’ve tested, which tells me you’ll get about an average amount of sinkage here. What exactly does average mean? For me, it means you’ll likely feel some slight give into the top layers of foam, but that the pocketed coils in the base will lift you up and out of the structure for a more “on top of the bed” feel. Is the Brunswick Mattress Right for You? Considering how bouncy the Brunswick is, I think it could make a fantastic option for combo sleepers who need to move around and change positions throughout the night. It could also be a solid pick for anyone who needs a durable structure, as the pocketed coils combined with the tough cover allow for more wear and tear. 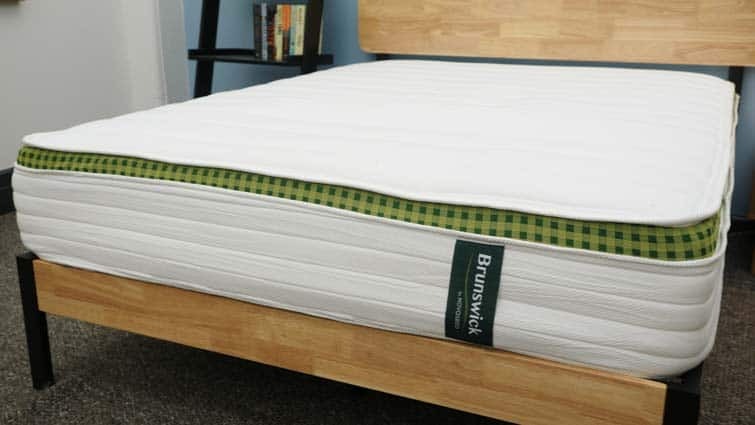 And of course, the Brunswick is a great mattress for Canadian sleepers who want a product developed and made in their home country. Memory foam has a slight reputation for overheating at night, so the Brunswick may sleep a little too hot for some sleepers. Heavier folks may also find the bed isn’t supportive enough for their needs, as it comes in at just about medium firm. Sleep Trial – 120 nights. Shipping – Free, comes compressed in a box, though I should note that it’s only available in Canada. If you’re convinced the Brunswick is the right mattress for you, the size and pricing information for the mattress are below. Please note that these prices reflect standard pricing, but coupons are often available.